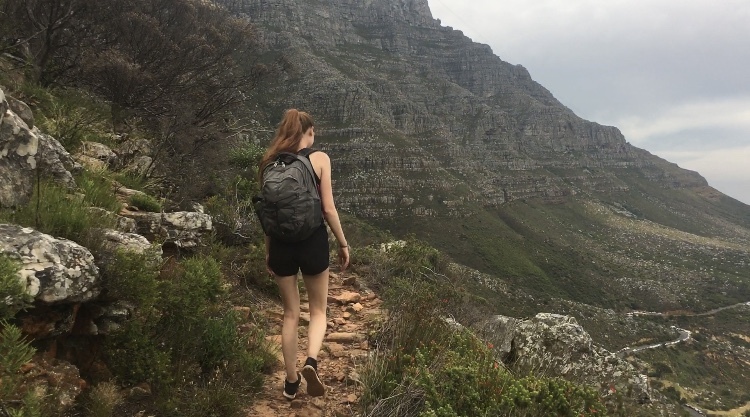 Being surrounded by mountains is something new for me, but here in Cape Town, I have caught the hiking bug. I have really enjoyed spending a morning or a day climbing up one of the mountains here and being rewarded with beautiful views of the city. There are three mountains that are the most well known here and that sit right in the middle of the city. They are Devil’s Peak, Table Mountain, and Lion’s Head. Table Mountain is the most well known of the three due to its unique flat top. The three mountains together, famous for making up Cape Town’s cityscape. Throughout the semester, I have climbed both Table Mountain and Lion’s Head a few times each. Last weekend, however, my friend, Noelle, and I wanted to take the next step. We decided to take on the three peaks challenge. This involves hiking all three mountains in one day. The official challenge requires participants to start in the city center and go back to the starting point to check in between each mountain. Noelle and I took the easy route and did the unofficial version, though, just hiking each mountain back to back. Our day started early at 6:30am when we got to the Devil’s Peak trail. We had never hiked Devil’s Peak before, so we weren’t sure what was in store, but it was a beautiful hike. There were lots of flowers and bushes along the trail, and once we got closer to the peak they got thicker and the path got narrower, so we had to carefully navigate. It was not as long of a hike as we expected, which meant we got to see the beautiful view quicker than expected. From the top we could see the view of the front of Table Mountain, and if we turned around we looked down to see UCT campus with all of its orange-roofed buildings and rugby fields. One peak down, two to go! After enjoying the views and taking a quick snack break, we began our descent. About two thirds of the way down Devil’s Peak there is a path, which connects Devil’s Peak and Table Mountain. We turned onto this path and made our way towards Table Mountain’s Platteklip Gorge. We had hiked along this path before, so we knew the route to reach Table Mountain, and once we got here, up we went. The climb up Platteklip Gorge is not nearly as enjoyable, as the views from the top. It’s a zig-zag path all the way up with big stair-like rocks. It is also a popular trail, making it crowded and congested at times. Nevertheless, we powered through with a positive attitude and reached the flat top of Table Mountain. The top of Table Mountain is beautiful, with lots of rock formations and various plants. Table Mountain has its own ecosystem of plants living atop it, with flowers, bushes, and other species that are unique just to Table Mountain. Isn’t that neat? We roamed around the top of the mountain for a bit, admiring what is considered one of the new seven wonders of nature, before sitting down and eating our packed lunches to sustain us for the remainder of our hike. We had more one walk around before starting the trek down the gorge. You would think that climbing down would be a bit faster because you have gravity and momentum on your side, but the steep rocks and their smoothed surfaces from so many hikers make going down a slippery adventure. It took us just as long to hike down as it did to get up there, surprisingly only slipping once. We then headed over to Lion’s Head to hike the final peak of the challenge. 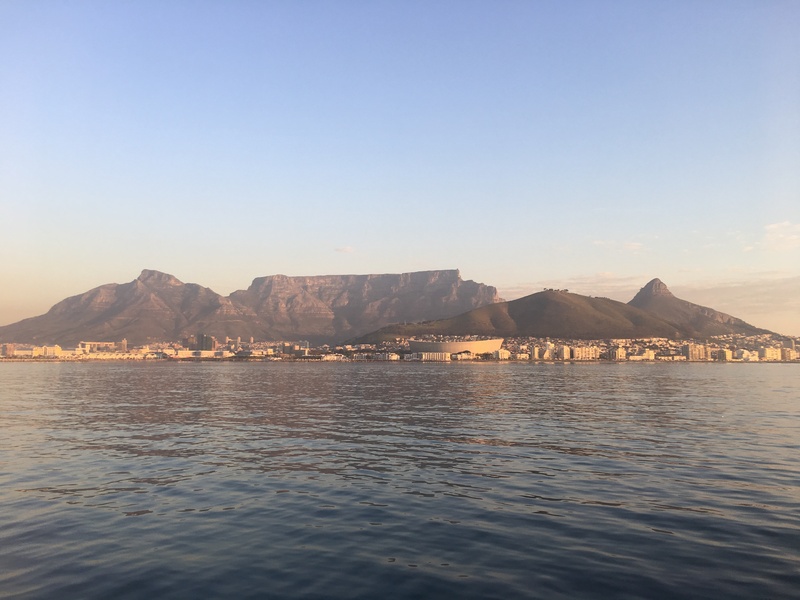 Lion’s Head is the easiest and shortest mountain to climb of the three peaks. Well, that’s if you don’t hike the two other peaks beforehand 🙂 We took the climb slow and steady, taking a long break to have another snack and watch other hikers go bye, cheering them on as they passed. After we had caught our breaths and given our legs a needed break, we continued our climb. A fun part about Lion’s Head is about two thirds of the way up is a fork in the road. You can either take a longer footpath route, or a shorter climbing route that involves chains and staples that have been installed in the rocks. We were feeling adventurous, so we opted for the shorter route, and lifted ourselves up the rocks with the help of the staples. A short while after climbing up and hiking along a bit more of the path, we reached the final peak! Lion’s Head has one of my favorite views. Because of its location, a little bit separated from Table Mountain and closer to the coast, you get an amazing 360 degree view of Cape Town. On one side you see Table Mountain and Devil’s Peak. On another you get a clear view of the strip of beaches and the water. And in yet another area you get a great view of the city centre. We walked around the perimeter of the top, soaking in the beauty of each view while giving our legs some rest before making the final descent. We then headed down, steadily and carefully, until we reached the bottom of Lion’s Head to complete the three peaks challenge! After a total of 9 hours out on the mountains, we finally made it. Our legs had turned to jello by the end, but it was definitely worth the great experience and accomplishment. It’ll be a big switch going from this mountainous city back to the flat lands of the Midwest, so it was good to get a full day of hiking in before heading back home!